North Carolina has more than one million acres of USDA Forest Service land within Croatan, Uwharrie, Pisgah and Nantahala National Forests. These forests are not immune to North Carolina's wildland/urban interface problems or to damage caused by natural disasters such as wildland fires. Though wildfires play an integral role in many forest and rangeland ecosystems, decades of efforts directed at extinguishing every fire that burned on public and private lands have disrupted the natural fire regimes that once existed. Moreover, as communities develop and grow in areas that are adjacent to fire-prone lands, wildland fires pose increasing threats to people and their property. Following a landmark fire season, the National Fire Plan was developed in August of 2000 with the intent of responding to severe wildland fires and their impacts on communities, while ensuring sufficient firefighting capacity for the future. The NFP addresses five key points: firefighting, rehabilitation, hazardous fuels reduction, community assistance, and accountability. 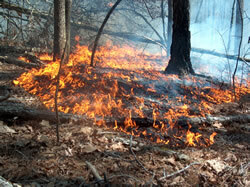 Under the authority of the National Fire Plan, The USDA Forest Service's Community Protection Grant Program was established to provide funding to states to help prevent wildfires and mitigate the conditions that lead to them in high risk communities within a 10 mile radius of National Forestland. Community risk is determined by vegetation type, available vehicle access, terrain, response times for emergency personnel, and access to water sources. The program emphasizes collaborative planning between the N.C. Forest Service, USDA Forest Service, and communities to maximize mitigation and prevention efficiency. These plans list prevention, mitigation and community projects in priority order based on wildland fire hazards and available funding. 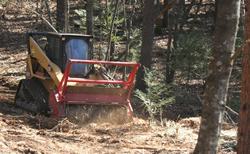 Since there are no costs associated with this program for the landowner and the controlled burning and mechanical fuel reduction treatments are performed by the N.C. Forest Service with funding support from the USDA Forest Service, this is a great opportunity for qualifying landowners/communities to reduce their wildfire hazard and work toward becoming a Firewise community if they wish. If you would like to find out if your community qualifies for the program or speak with someone about it, contact your county forest ranger.